Our design team uses state-of-the-art CAD/CAM tools enabling us to interface with all standard formats and seamlessly transfer to manufacturing. Our design control procedures are among the best in the industry ensuring requirements are appropriately captured and met through the design process. Our design team is trained to identify risks in product design and project timelines and communicate these as soon as they are identified. Medin offers complete graphics capabilities under one roof. 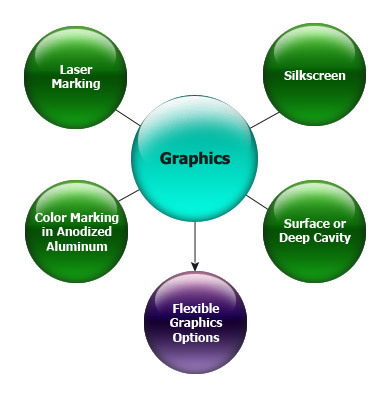 Laser marking, silk-screening, and color marking in anodized aluminum can all be done on surfaces or in cavities. Here we use state-of-the-art design tools giving us the ability to create stunning 3D vector images. Our 3D vector-based silk screened or laser instrument “maps” are visually captivating and scaled to the actual size of the instrument, making identification and set-up less time consuming and easier for the end-user. We have many options for identification of products, inventory control, and we make your products look great!